In the case of homophones, I remind students that HOMO means same and PHONE means hear (roughly). Thus, homophones are words that sound the same as each other (but are not spelled the same). With younger kids, I tell them that homoPHONES sound the same when you’re talking on the PHONE–that if you don’t see them written or hear them in a sentence, you don’t know what the speaker means. First of all, I have students highlight the word HERE within tHERE. I remind them that THERE is the word we use when we want to say HERE and THERE. That works for a while; however, it still focuses on position. That is just one of many uses for there. Secondly, I tell students that THERE is used when we want to say THERE IS and THERE ARE. This is important to note with older kids especially because these present many challenges, starting with “Do I use THEIR or THERE this time?” and continuing with “Do I use there IS or there ARE?” (In other words, there (and here) presents many subject-verb issues for older students! In moving from there to THEIR, I do something similar in that I have students highlight the HEIR within the word THEIR. The word their is a possessive pronoun. An HEIR is someone who will take the reign. I remind students that someone will be HEIR to the THRONE. And just like a prince is the HEIR, THEIR shows possession. For younger kids, I tell them the HEIR owns the throne and THEIR shows that someone owns something. For older students, I remind them that their is a pronoun–and pronouns NEVER show ownership/possession with an apostrophe. (This is debatable for those who call words like other pronouns, but that doesn’t affect most pronouns.) In this regard, I tell them that you would never write their’s to show possession. Since I consistently teach that you do not show possession to a pronoun with an apostrophe, students are used to not using an apostrophe with pronouns. So they’re would never be used to show possession. When an apostrophe is used with a pronoun, it always means a contraction (he’s, she’ll, they’re). Contraction means squeezed. I tell students that a contraction is made when you squeeze two words together so hard that some of the letters pop out, and you must put an apostrophe in place of some of the letters. Then I teach something every other class session: Say contractions UNcontracted when you are about to write them. You will know for sure that you want that contraction if you always say the two words (in your head): THEY’RE here–they are here…yes! When providing practice for these with young children, it is good to do the first two, then practice. Then add THEY’RE and practice. My favorite way to practice is to “choose the correct word” for youngers and have olders write the answers in the blank. Be sure the practice has the exact same types of uses as the lessons had. Homophone errors are common in writers from second grade through senior citizens! Thus, the real place to practice these words is in the students’ writing. Students need writing teachers who take the time to thoroughly edit their papers, so that the students can learn from their own errors. Rather than holding back on “correcting” their rough draft papers, I use these papers as opportunities to teach. Using proofreaders’ marks, I mark out the incorrect homophone and write the correct one above it. Use every encounter with students as an opportunity to teach! Crossword puzzles. Hidden words. Fill-in-the-blanks. Join-two-or-three-parts-of-words-together (not always at syllable breaks..agghh….). Graph paper practice. Circle the correct spelling. Highlight the word families. Syllabication. All viable spelling word practices. Some work. Some don’t. Some work for some kids but not for others. 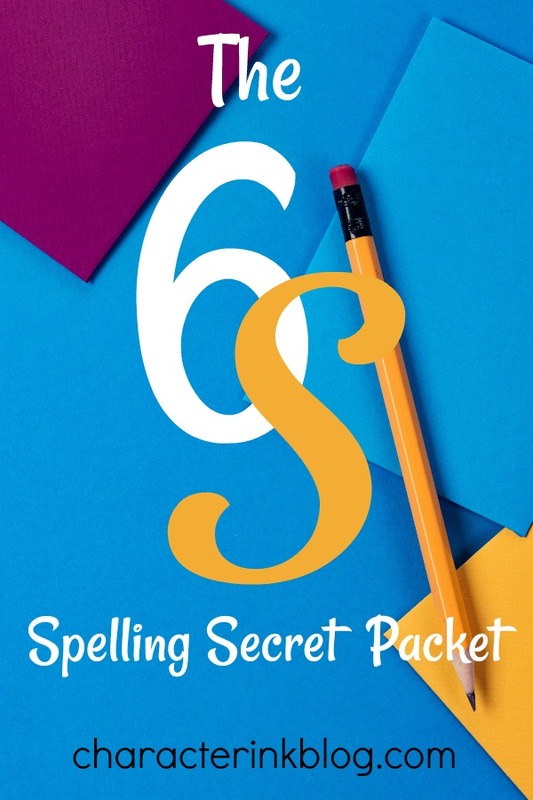 Enter my Six S Spelling Secret Packet–the technique that is used weekly in my Character Quality Language Arts program–and that brick and mortar and homeschool teachers are using weekly thanks to our new downloadable products!